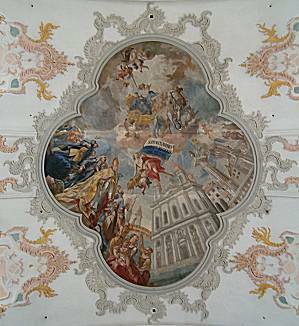 Lucerne's Jesuit Church is the first large baroque church built in Switzerland north of the alps. First and foremost is an expression of the Catholic Church's 17th century struggle to regain spiritual leadership in the counter-reformation At the same time it does show, that the Catholics then refused to accept any discussion on major points of criticism by the protestant churches. 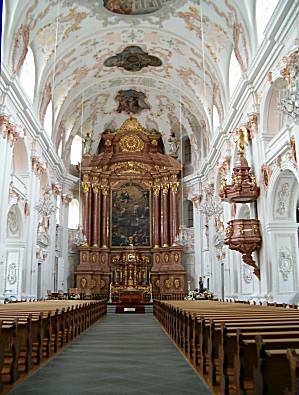 Instead, baroque architecture displays power and glory and emphasizes exactly those parts of Catholic tradition (especially the veneration of saints) and visual culture (as opposed to the protestant emphasis on the word of the biblical scriptures). There is perfect logic that Lucerne, seeing itself as the capital of the Catholic fraction of Switzerland in pre-modern times, should have constructed this building. Today, Jesuit Church is a major tourist attraction and serves as a concert hall while it has become almost irrelevant to local church life from a religious point of view. There are other churches in the city expressing the beliefs of Swiss Catholics after the Second Vatican Council far better (St. Karl and St. Johannes, for example). The Jesuit order, founded by Ignatius of Loyola in 1534, served as papal elite troops in the spiritual fight against protestantism. The Swiss Reformation, conducted by reformators Zwingli in Zurich and Calvin in Geneva divided Switzerland and left Lucerne as the only major Swiss city to stay with the traditional catholic beliefs. The program of the catholic Counter Reformation, as laid out on the Council of Trent (1545-1563), did not really take up any theological arguments of the reformators, but rather concentrated on organizational reforms, especially on better education. 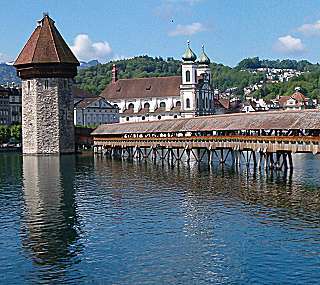 In this context, the Jesuits were called in to Lucerne by the city council in 1573 to establish a college. 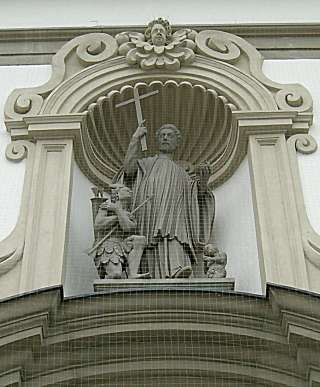 Ludwig Pfyffer, mayor of Lucerne, offered annual financial support to the Jesuits out of his private funds. The Jesuit College of Lucerne was established in 1577 in Ritter Palace, a building originally erected in 1557 as a residence for mayor Lux Ritter (today Ritter Palace serves as the seat of the cantonal administration). The college grew fast and had 300 to 400 students betwenn 1650 and 1700. First ideas to construct a proper church next to the Jesuit college go back to the 1630's, but only in December 1666 the cornerstone of Jesuit Church was laid, and the construction began in 1667. By 1673 the shell of the church and the main façade were completed. 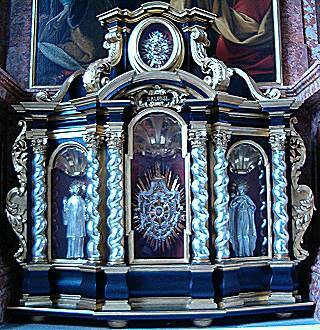 The church was consecrated in 1677, though the interior was not yet really finished. Several side altars were still missing and even the high altar was only erected four years later, due to financial problems. The onion topped towers were not completed until 1893. 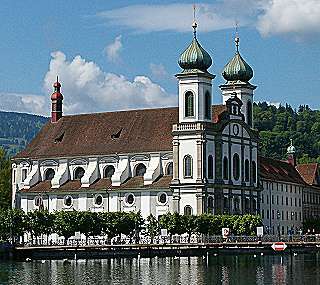 Lucerne's Jesuit Church is the first large baroque church in Switzerland. 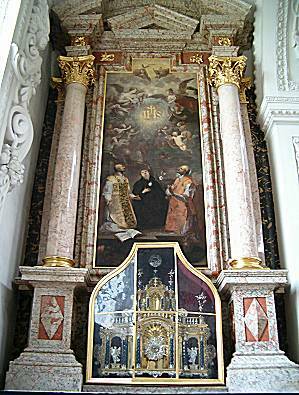 The prominent presentation of relics to spite the protestant iconoclasts is characteristic of the spirit of the catholic Counter Reformation. 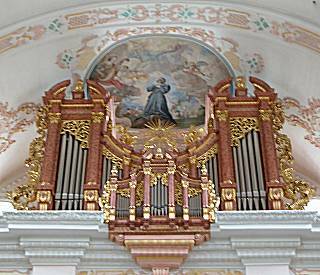 Main organ, built by Swiss organ manufacturers Metzler in 1980-1982. 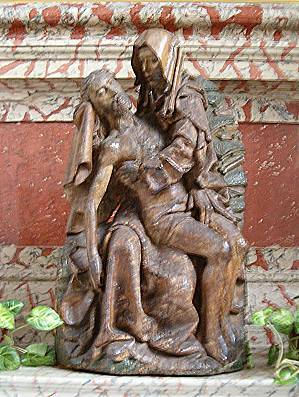 The case was restored using parts from an older organ dating back to the 18th century. 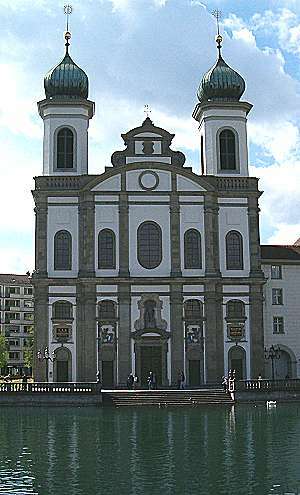 Jesuit Church is frequently used for organ recitals.